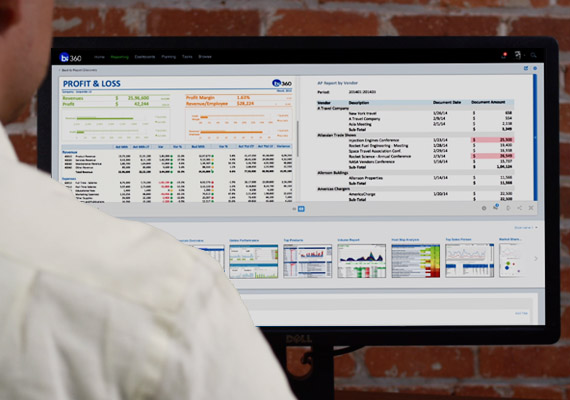 When it comes to financial and operational reporting and budgeting, our BI360 Solution delivers everything your organization needs: detailed reporting that runs live on your ERP, excel- and web-based with mobile access, pre-defined templates, drag and drop simplicity, and very easy implementation. But a growing area of interest for many of our customers is our BI360 data warehouse, which has the capability to bring in all kinds of data in addition to financial and budget data, such as statistical data and operational data sources. For example, in the education industry, a university could use our data warehouse to more effectively track critical information such as student enrollment, registration, faculty performance, financial information—everything a university needs to turn stagnant data into a competitive advantage. For a healthcare organization, it could be patient records or healthcare system statistics that would not only deliver better compliance with industry regulations, but better patient care as a result. With BI360, any industry-specific organization with high-value data can pull that information into our data warehouse to glean insights and make it part of its standard reporting process. From there, it’s easy to combine it with financial data for powerful dashboards and management reports. These are just some of the ways organizations can use BI360 data warehouse as the engine of their business intelligence solution, and drive better decisions as a result. With BI360 organizations can report live from their Enterprise Resource Planning (ERP) or from the BI360 Data Warehouse (DW). The question is which one is best for your organization. Each organization needs to determine which approach is best or whether a hybrid approach is best. This article will give the benefits of using each option. Live Reporting: there is a direct connection from many ERP’s directly into BI360, which allows for live reporting on thousands of fields. This means that once a transaction is entered into the ERP, then it is available for reporting. There is not a delay or a process that a user needs to wait for. Cost of Configuration: BI360 is already pre-configured for thousands of fields in many ERP; therefore, once the software is installed a person can start building reports. Metadata: as mentioned, there are already multiple modules and thousands of fields already available for many ERP’s, such as all Microsoft Dynamics products, Sage MAS500 and X3, and Epicor Prophet 21. Standard modules and fields are constantly being added at no cost. Speed: using the DW enables organizations to perform many tasks to speed up reports, such as indexing, using a different server which is recommended, and using the flexibility of the DW to enhance report building. Report Design: Building reports directly from ERP requires hard-coding many times, such as accounts. For example, cash would be a specific account range and then accounts receivable would be set up as another range. The DW allows an organization to create trees or attributes so that the report design can point to current assets and the report will dynamically expand. This will limit the number of groupings, which will greatly enhance speed. Please refer to the White Paper BI360 White Paper – Using Attributes instead of Account Ranges. For a free copy, please email CompleteInsight@solverusa.com or if you are an existing customer you may access it as well as many other resources on the portal. Consolidation: consolidating multiple companies from the ERP requires the multi-company tool. The DW allows companies to build hierarchy trees and report on any level of the tree. Combine Multiple Sources: gives the ability to combine multiple data sources and report from them using one connection. There are many advantages to using either solution, but we have many clients that use a hybrid solution. The recommendation would be to clearly define what reports would be built connecting to the ERP vs. the DW, so that there is no confusion within the organization. An example of a hybrid approach would be using the ERP for subledgers and the DW for budgeting and financial/operational reporting.